By Claudio Schneider and Timothy Martin, Riverside Technology, inc.
Comprehensive training included custom-designed modeling techniques. Data compiled from national and international sources was organized using metadata tools. Analysis of satellite imagery produced a national land-use/land-cover classification. According to a recent fact sheet published by the U.S. Agency for International Development (USAID), agriculture is the second largest contributor to Iraq's gross domestic product (GDP), employing about 25 percent of the labor force. Decades of mismanagement, poor planning during the past regime, and the current political conflicts put this critical sector in dire straits. Iraq will need to import an estimated $3 billion per year in basic foodstuffs over the next decade if domestic agricultural production does not increase. Identifying and understanding the nature of current physical and anthropogenic limitations and their interactions and effects on agricultural production are essential for rebuilding Iraq's agriculture. 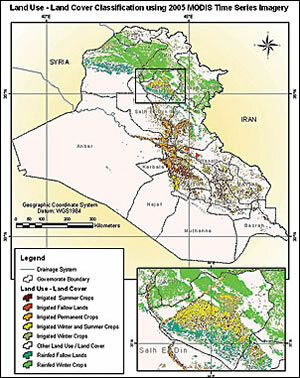 Land-cover classification of Iraq in 2005. 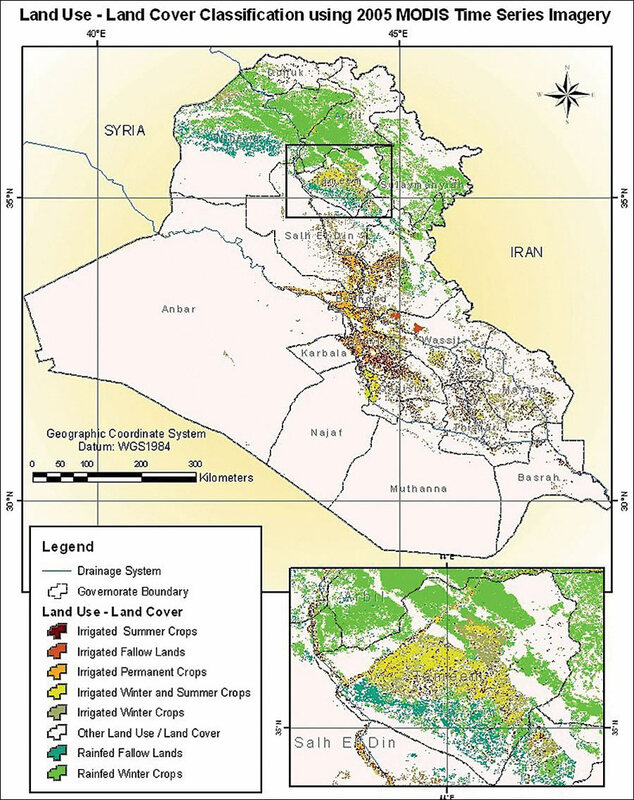 In 2004, the Iraqi Ministry of Agriculture (MOA) requested USAID to create a reliable GIS database and maps to support agricultural development. The project would rely on GIS and remote-sensing software and tools to bring together disparate data sources and apply modern concepts of Agro-Ecological Zoning (AEZ). AEZ is a decision support methodology developed by the Food and Agriculture Organization (FAO) of the United Nations. GIS modeling techniques would be used to identify crop-specific limitations of prevailing climate, soil, and terrain resources under assumed levels of inputs and management conditions to produce high-quality crop suitability maps. AEZ would provide decision support tools that could assist the government of Iraq by increasing agricultural production, improving food security, optimizing investment, and preserving natural resources. The AEZ project was implemented under the USAID-funded Agriculture Reconstruction and Development for Iraq (ARDI) program during 2005�06. Development Alternatives, Inc. (DAI), responsible for the overall implementation of ARDI, selected Esri Business Partner Riverside Technology, inc. (RTi), as a subcontractor to provide technical expertise to Iraq's MOA. Developing Iraq's national AEZ program required a comprehensive series of training courses in GIS, remote sensing, AEZ methodologies, and related applications. The training was given to decision makers, planners, and technicians in Iraq's ministries of agriculture, water resources, and transportation and planning, as well as academics at the University of Baghdad and private-sector counterparts. To facilitate training, ARDI established a state-of-the-art AEZ training and production laboratory in the Kurdish region of Iraq that included Esri's ArcGIS and remote-sensing software. Esri software was selected because it provided the most complete set of tools to implement such a complex spatial modeling project. The comprehensive training curriculum included basic and advanced GIS and remote sensing. The courses were custom designed to provide trainees with hands-on experience with GIS modeling techniques required for AEZ characterization and spatial analysis training: raster analysis, interpolation techniques for climate data, surface analysis for generating digital elevation models (DEM), geostatistical analysis, and land suitability mapping using ArcGIS Spatial Analyst and ModelBuilder in ArcInfo. Complementing the GIS and remote-sensing capacity building were crop modeling workshops, where Iraqi scientists and international consultants worked closely to define crop characterization requirements and land suitability analyses for Iraq. A key outcome of the crop modeling sessions was the adaptation of crop, soil, and climatic requirements into an automated land suitability model. Improving agriculture decision support systems in Iraq requires reliable environmental and socioeconomic information. Previous environmental studies undertaken in Iraq produced inventories of climatic, soil, terrain, vegetation, and water resources. Information was also available from the international community through books, journal articles, and various databases. However, this information was scattered across many international and Iraqi government and nongovernmental organizations (NGOs) and was not entirely accessible. As a result, it was difficult to obtain a synthesis of the agroecology at the national or local level. Officials at the National Program for the Preparation of AEZ Maps collected data required for AEZ characterization from universities, NGOs, and other national and international organizations. In addition, ARDI obtained datasets from several international organizations. This collection and synthesis of data from national and international sources into a GIS was the foundation for AEZ characterization. The compiled data was organized using metadata tools in ArcGIS Desktop and integrated into the AEZ geodatabases. In addition to data collection efforts, AEZ specialists derived data from a variety of spatial analyses, including land-use and land-cover classifications, agroclimatic analyses, socioeconomic characterizations, and land suitability analyses. The analysis of 2005 moderate-resolution imaging spectroradiometer (MODIS) time-series satellite imagery produced a national land-use and land-cover classification and agricultural lands assessment, including a map of irrigated and nonirrigated agricultural lands and major crop types. The agroclimatic characterization required analysis of monthly climate time-series data for zoning and for matching land characteristics with crop ecological requirements. GIS models constructed in ArcInfo ModelBuilder automated the process, and results were entered into an automated crop suitability software tool specially developed to evaluate selected crops. The tool was designed to be updated easily with new information, such as revised soil maps and crop requirements. Additionally, the software tool was linked to the AEZ spatial database and allows the automated production of crop suitability maps. Rebuilding Iraq's agriculture in the current sociopolitical context presents many challenges. Any reconstruction goals will be difficult to achieve until security conditions improve, Iraqi government institutions can provide required services, and Iraqi citizens are able to conduct their lives and businesses in a favorable environment. With its focus on capacity development, data construction, and analysis tools, the AEZ project was conceived with a vision for the future. Consolidating data and developing decision-support tools for better and more effective decisions were aimed at preserving important information and making current and future agricultural reconstruction efforts more efficient. As a result of this project, Iraqi AEZ specialists have the capability to continue implementing the national AEZ program in the future and to expand the analysis to all the agricultural regions of the country. However, further technical assistance and investment in the AEZ program is needed in specific areas, for example, an agriculture monitoring system based on remote-sensing technology for national-level policy makers and planners. Such a system could quantify the amount and type of agricultural crops, provide estimates of crop production and yields, and monitor land and irrigation efficiency and water quality. The ultimate goal of the National Program for the Preparation of AEZ Maps is to establish a national agriculture information center that could serve advice to Iraqi farmers on which crops are suitable to grow in their area and when to plant these crops for optimum market conditions. Dr. Claudio Schneider is a remote-sensing and GIS scientist at Riverside Technology, inc. He was manager of the Agro-Ecological Zoning project under subcontract to Development Alternatives, Inc., for the USAID-sponsored Agriculture Reconstruction and Development for Iraq program. Dr. Timothy Martin is vice president of Riverside Technology, inc., and was principal in charge of the Agro-Ecological Zoning project and instrumental in its conception and design. For more information, contact Claudio Schneider, Riverside Technology, inc. (tel. : 970-484-7573, e-mail: claudio.schneider@riverside.com). Disclaimer: The information and views presented in this article are solely those of the authors and do not necessarily represent the views or the positions of the U.S. Agency for International Development or the U.S. government.